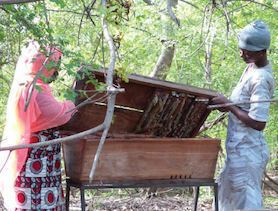 A few years ago, Sarah could only earn income from what she could grow on her one acre of land. As a 25-year-old wife and mother of two, her soybean, corn and groundnut crops just weren’t enough to help support her growing family. 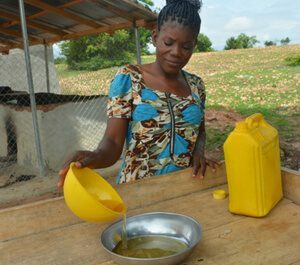 Barriers like the lack of access to land, unpredictable weather that makes farming difficult, and traditional beliefs about women’s and men’s roles make it difficult for northern Ghanaian women like Sarah to earn enough income to invest in a sustainable business. But that changed the day Sarah joined the Resilient and Sustainable Livelihoods Transformation (RESULT) project through Canadian Feed The Children, a six-year, $19-million development project, implemented by ACDEP, and funded by the Government of Canada and generous private donors wrapping up in August 2018. Sarah joined a group made up mostly of women in her community who wanted to start an aquaculture, or fish farming, group through RESULT. This in itself was already a big feat – aquaculture is relatively new to northern Ghana and has traditionally been the work of men. When the group started looking for a chairperson, Sarah immediately put her name forward. She wanted to take on a leadership role. The group agreed she had what it took and voted her in. Sarah and her group received start-up inputs for one six-month cycle of production in small-scale fish cages. That includes five cages, a canoe, an initial stocking of tilapia, and training on harvesting, marketing and business skills. Sarah smoking fish to sell in the market. For the past year, Sarah has been responsible for steering the business operations of her aquaculture group. She is excited about the early results: “From the few [fish] harvests my group has had since March this year, we are convinced that cage fishing has a great potential to guarantee our economic success!” she said. Sarah spotted an opportunity to expand the business when one day, after the group had unusually high production, there were leftover fish at market. Working with the RESULT team, Sarah introduced two grilling ovens to her group. Her fellow team members learned how to smoke their fish to preserve them. Sarah soon learned that smoked fish sells at a premium to local restaurants: the high-demand product has an underserved market and is helping aquaculturists like Sarah and her group increase their overall revenue significantly. 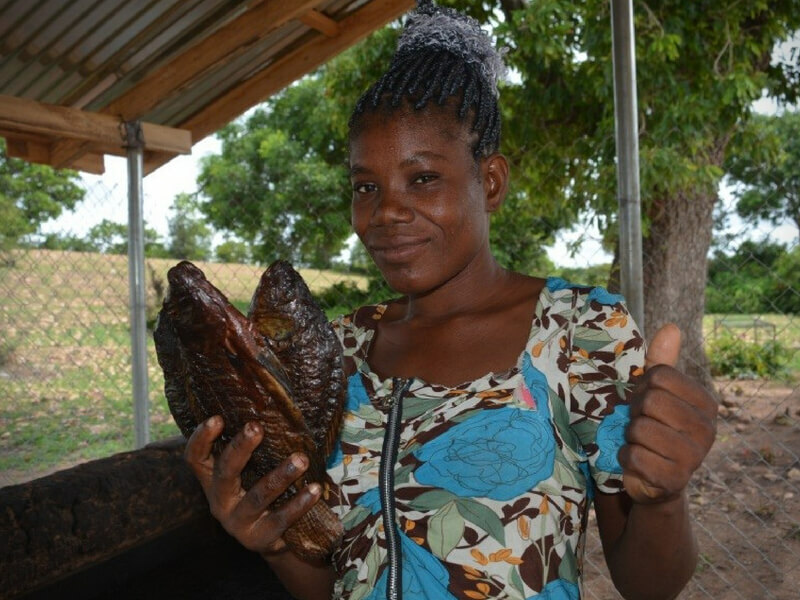 Between selling fish at the market and upselling their smoked fish, Sarah’s group is providing a high protein food to their community, helping to improve their household income, and helping to fill a gap in the overall market. According to Ghana’s Ministry of Food and Agriculture, only 60 per cent of fish consumed in Ghana are produced domestically, in a country with one of the highest fish consumption rates in sub-Saharan Africa. And it’s showing in the group’s profit. 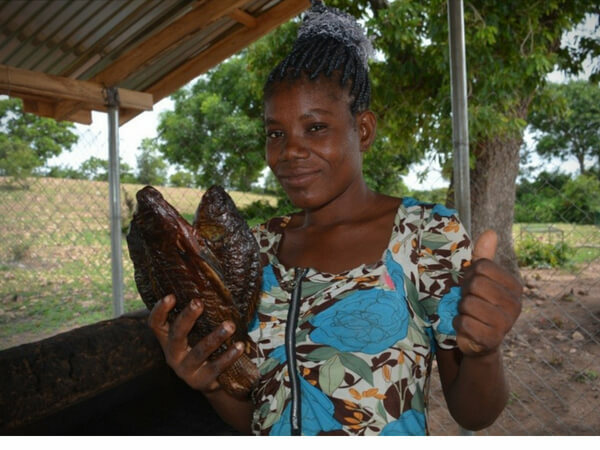 “For the first time in my entire life, it is this fish business that has allowed me to handle and manage money worth over GHC 5,000 ($1,350 CAD),” Sarah said. Based on the success of selling smoked fish, Sarah began to look at other ways to add value to their fish business. 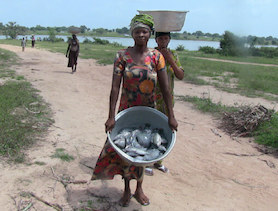 After extracting the oil from the fish, Sarah can sell it as a new source of income. 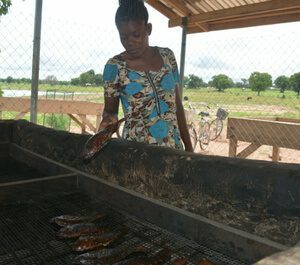 Working with RESULT, the group got training on how to produce cooking oil from the fish – a product that is less common, but which sells well, in northern Ghanaian markets. Sarah has been testing prototypes of this oil, producing it in small batches which she is using at home. She has plans to test it on the market soon to provide a new income source for her group. Through Sarah’s leadership, entrepreneurialism, and passion for innovation, her group is in good hands. RESULT’s income generation and agricultural best practices, including aquaculture, dry season gardening, and artisanal products like soap-making, basket weaving and shea butter processing, have succeeded at elevating subsistence-level farmers to sustainable livelihoods and reducing the “hunger gap” from five months to nil. A pond of fishies plus a field of veggies is a well-balanced combo for good nutrition!